Commentary is provided by your guide and all riding apparel is included. And the best thing? No licence is required and no experience is necessary. Your ride...your adventure!!! Island Views - Bays with Sea Turtle Encounters - One and a half hours Jet skiing. Informative and entertaining commentary is provided on all tours by a qualified guide. Bottled water and all riding apparel including tops, sunglasses/goggles, hat and safety gear are included as well as courtesy pick up and drop offs. Tours operate daily in most weather conditions and no licence or experience is necessary. Informative and entertaining commentary is provided on all tours by a qualified guide. Bottled water and all riding apparel including tops, sunglasses/goggles, hat and safety gear are included as well as courtesy pick up and drop offs. This half day tour operates daily in most weather conditions and no licence or experience is necessary. 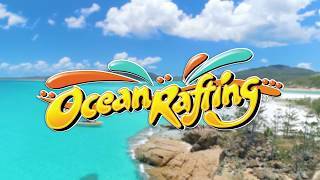 Ocean Rafting offers an exhilarating ride to Whitehaven Beach and Hill Inlet, pristine snorkelling reefs and guided Whitsunday Island National Parks walks. Ocean Rafting offers the ultimate access to stunning Hill Inlet beach and special snorkel sites ensure a memorable underwater experience. 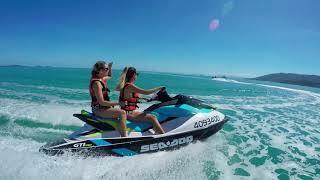 Whitsunday Jetski Tours’ Airlie Adventure offers the perfect mix of adrenalin and eco adventure, exploring the beautiful bays of Airlie Beach on the latest model jetskis. 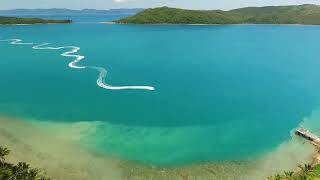 Whitsunday Jetski Tours’ Two Island Safari is a great tour for the more adventurous traveller who wants to maximise their time on the water. Explore the beautiful Whitsunday Islands including the scenic waterways around Daydream and South Molle Islands while pausing for photos, power snacks and the occasional marine life encounter.